It was a rainy Monday night, and my daughter hopped in the car after a grueling practice. In the process, she stepped on my brand new book. With. Her. Wet. Shoes. All it took was a glance at my face for her to know I was not pleased. All it took for me, was a look at her face for me to see that I was about to crush her spirit. I knew then: I had an opportunity. In an instant, her face softened. I knew then I had been set free. So many times we tell our kids to get their priorities straight. And then we stand before others and tell them about our focus: Faith. Family. Then Everything Else. The reality is that it is easier said than done. The pursuit of happiness won’t bring you what you really seek — joy. That deep-down feeling that all is right with your world. But how do you find joy, when women of today are told we can have it all — only to be reminded of this futile pursuit of perfection when we browse Pinterest boards in search of projects to pin that we’ll never complete? I want to be viewed as a woman who loves big, laughs loud, and creates beauty. I am choosing to create the life I have always wanted to lead. I gave myself permission to focus on the things I find important, by saying no to things that weren’t — instead of feeling obligated to comply. Six days after that fateful rainy night, my family’s day was jam-packed with activities for kids. I called an audible and announced we’d take a side trip — to a museum and a yummy lunch spot. Instead of complaining about the long wait, we took it in and enjoyed the time together. That’s when my daughter asked me to take a photo of her. I am convinced that this is the image I was supposed to see: Arms outstretched, head rocked back, and feet off the ground. That is joy! We cannot help others or express gratitude with our arms folded. We cannot see the beauty in life with our heads down. We cannot experience joy by dragging our feet. 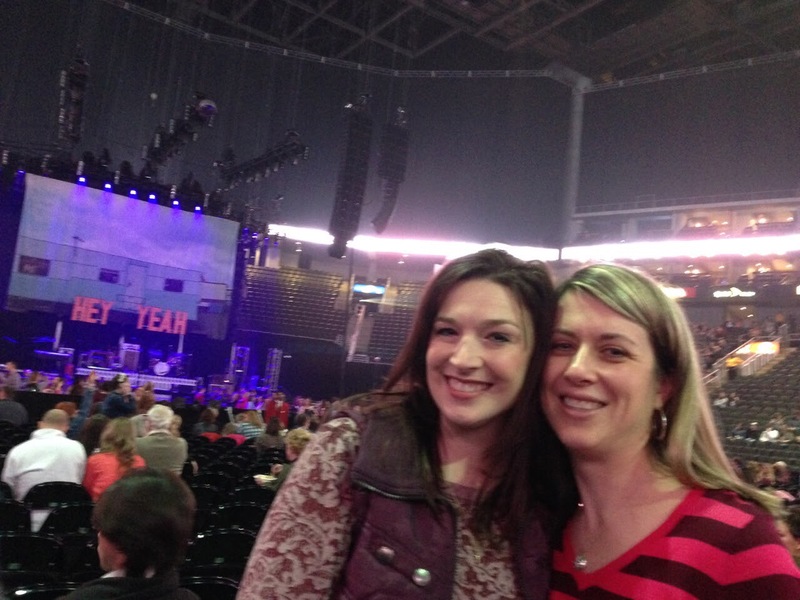 This much, I know: If I want to experience joy, I must have my priorities right: Faith. Family. And Then Everything Else. 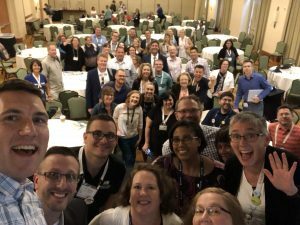 Lesley and I met a few years ago through our school PR connections, and this awesome little thing called #k12PRchat. As our friendship has grown over communications strategies and best practices, so has our connection around living our best lives, without excuse. When we started texting about the new book that got stomped on, I knew there was a guest blog waiting to happen. 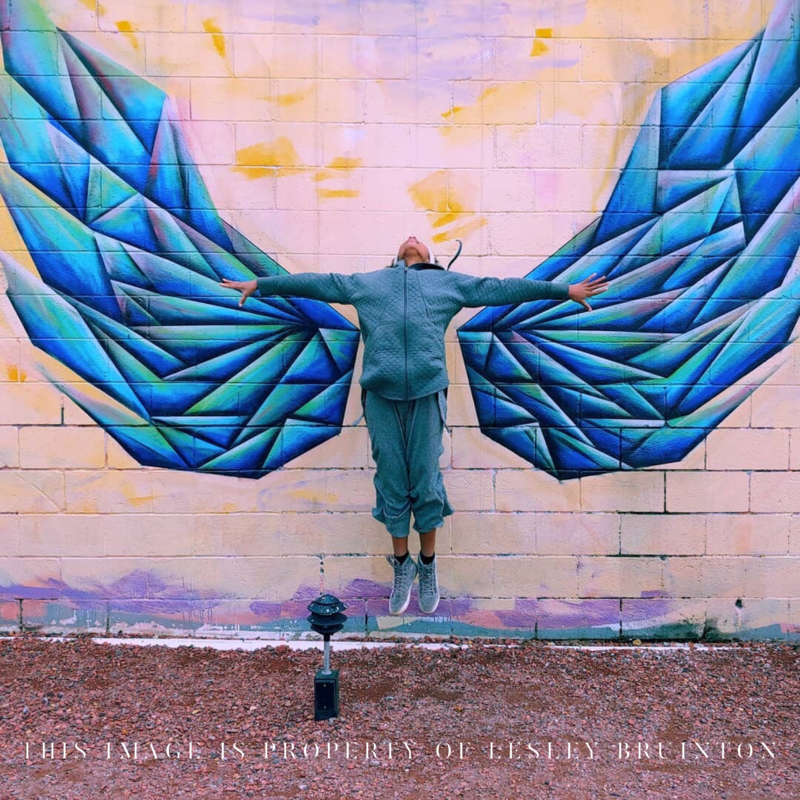 Lesley took her daughter’s photo at MELT, an Alabama restaurant where restaurant goers can pose with the angel wings mural. Follow Lesley on Twitter here. I will never forget my husband’s words. Although I can’t remember exactly what prompted them, I remember where we were standing. And I remember that he was focused and serious. It was 2016, and a month or two after colon cancer had taken his 39-year-old twin sister. My one and only twin-law. We were in the kitchen, and it was a short conversation. But his words still ring in my ears, nearly three years later. The intensity of his eyes and voice were unmistakable; I took note. And I fought the urge to understand exactly what everything is going to change might mean to my nicely engineered life of job and husband teaching and kids growing and summer trips to the lake. Somehow, I resisted the temptation to figure out this passing prophecy. And somehow, I wasn’t afraid. Today, I can’t help but look back at three years navigating. We have steered through grief, joy, loss, gain, fear, faith — change — and I realize now that I never could have understood the details of those kitchen words in 2016. But, indeed. Everything has changed. We are growing. The kids are bigger. Our courage is, too. We are letting go. Of the trap notion that our value comes from what we do — how much — and how quickly. We are healing. With therapy, self care, and more grace than I can possibly explain. And while we still live in the same house in the same town — with the same carpet and kitchen appliances that I pray will change soon — nothing is the same. Emily taught me a lot, both before and after she died. She taught me to get excited about little things. To laugh too loud. To mildly annoy others with how many pictures you take. To trust God with everything. To live a life of loving others. And whether I learned this from her, or from her passing, Emily also taught me to find happiness. Not to settle. To allow for change. To pursue what’s best for my family, without feeling compelled to explain. She taught me to accept that everything can — and sometimes should — change. And most importantly, she taught me that the pursuit of uncommon wellness is always worth it. In this spirit, I hope you’ll keep your eyes open for a new focus on my website. I’m going to start sharing more about the life I’m leading, especially my passion for authenticity, vulnerability, courage, and, of course, health and happiness. I’ll invite you to help me explore how kindness and compassion transform our lives. Together, we’ll navigate a path to live our best life and help others do the same. We’ll weave it all together with laughter and love — and all the space needed to create uncommon wellness in this crazy and wonderful life. 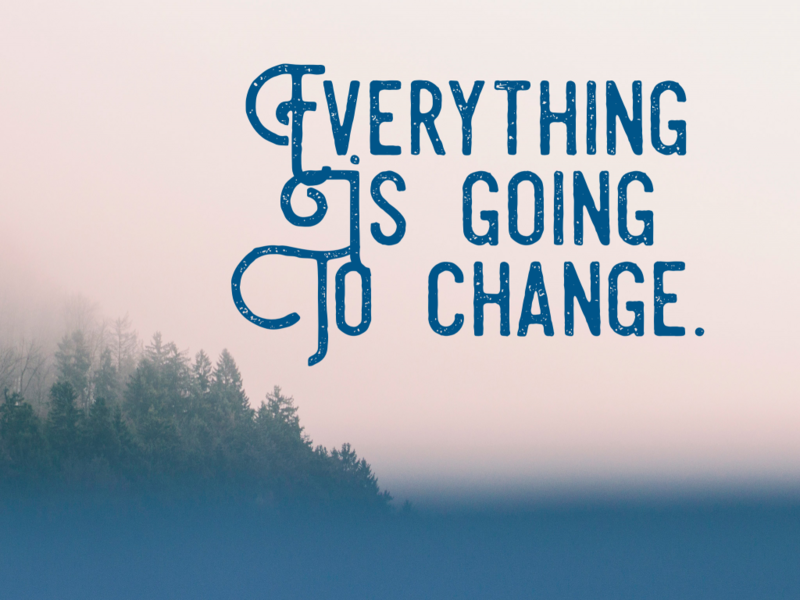 Everything is going to change. And it’s going to be good. I’m better at beginnings than endings. Which is why I’ve been staring at this screen for days and thinking about it (actively ignoring it) for weeks. Looking forward makes so much sense. It is opportunity. Adventure. Uncharted paths. No details, just broad, beautiful brush strokes. But looking back is different. It’s a painting with broad and narrow strokes. Dots and lines. Shadows and light. It’s both subtle and loud, at once. It’s too complex for words. It’s true. School PR has changed my life. It’s given me purpose. It’s given me an identity. It’s given me an incredible community of friends who feel like family. It’s made me a better human. 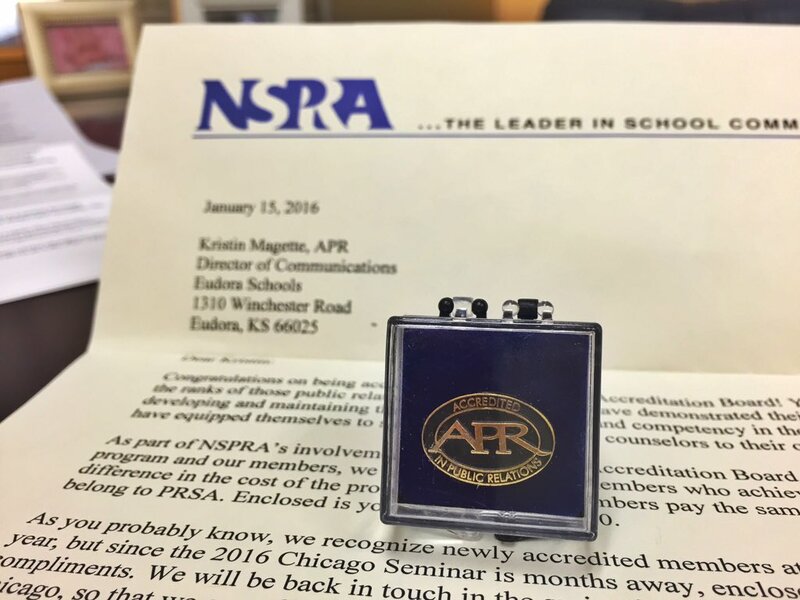 As months became years, school PR became a profession I loved, deep in my soul. A personal calling. The chance to create positive systems and programs that help kids and families. The opportunity to leverage new tools and elevate authentic engagement. Caring for all students and grappling with the issues of cultural competence, from race and religion to the gender spectrum. Doing right when faced with sexual assault, violence, drugs, suicide, mental illness. If public education is the nation’s guardian of an informed electorate — democracy — then school PR is the conscience that listens, sees, guides and seeks to solve. As practitioners we are at our best, behind closed doors. Wrestling with the most difficult, uncomfortable but impossible-to-ignore problems that society faces. Because those same problems live right here, in our schools and communities. And our students deserve our very best, every day. My love for this profession runs deep. And it swallowed me whole. It isn’t easy to admit that last part, mostly because many people probably saw someone who looked at the top of her game. It’s hard to share that my fierce love for this work eventually let me down. That my therapist told me I likely wouldn’t be entirely peaceful and well, so long as I was managing a social media community. That the years of life-and-death political advocacy burned me up. That I cared too much. I’m guessing my school PR friends can relate to the feelings of overwhelm and burnout that brought me here. The feeling when you know you care, too much. Of surviving to bring the good fight, for one more day. But this I know: Life isn’t about surviving. It’s about living. To my school PR friends … I hope you will use boundaries and self care to be well, and keep serving. This profession needs people like you. The world needs people like you, doing this work. And with that, my new beginning. It will be about seeing my husband and kids more. It will be about being just a mom at school. About snow days without burden. About July and August without the stress of trying to launch that space shuttle we call Back To School. And about school board meeting nights without, well, school board meetings. But it is time to say yes to something new. It is time to listen to friends who have encouraged and nudged me forward. It is time to rediscover my joy. True North. In scientific terms, it’s the direction along the earth’s surface towards the geographic North Pole. In personal terms, I’d define it as clear, non-negotiable values. That magnetic pull that points to your authentic self. My 2017 was a year of reflection, self discovery, vulnerability and personal growth. Hard work, but so rewarding. A year that began with restlessness and doubt — and far more questions than answers — became a path toward clarity. Uncovering my core values and beginning to intentionally lead my life in that direction. My True North. Sometimes I learned I was asking the wrong questions. (No wonder I wasn’t finding answers.) Other times I realized I was working far too hard. 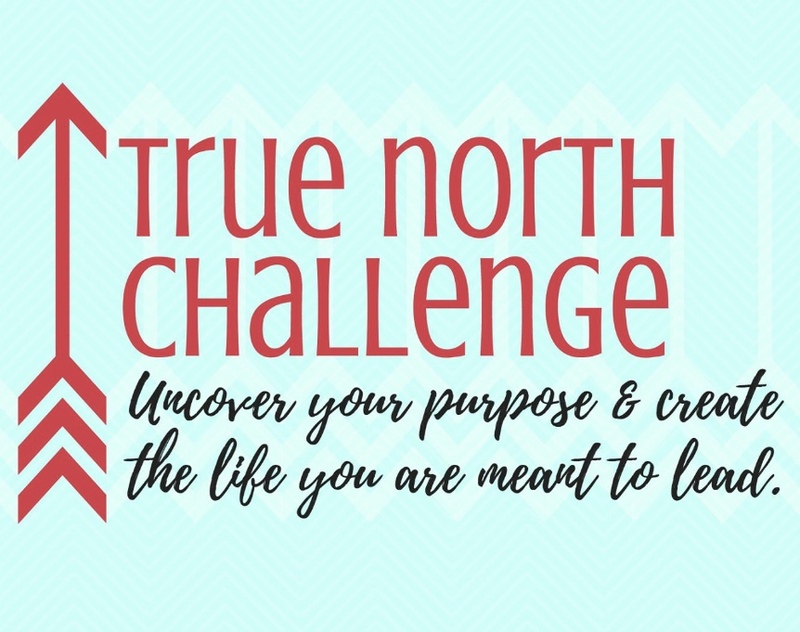 After all, True North isn’t about hustle — it’s about heart. It’s about listening, and being still. And so 2017 shifted my perspective, deepened my faith and reminded me that worth and value exist not outside, but inside. One of the friends who encouraged, supported and influenced me all year long urged me to share this path with others who seek the deep, pure peace that comes when you know your purpose on earth. And when the path for an authentic life is revealed. It’s a free, five-day online challenge (in a closed Facebook group). Jan. 15-19, maybe a bonus day on the 20th. And you’re invited if you’re ready to sort out your path and find clarity — whether it be in a relationship, career decision or other life change. Or maybe you just like self discovery — you are welcome, too! There are no strings attached … simply reflection and encouragement in a safe space. There’s no better way to start to a new year. If you are ready to trade restless for purpose, and orient to your own True North … join me! A year ago today, my husband’s twin sister passed away after a long, brave fight against colon cancer. Over the next few days, we said goodbye to a woman of beauty — full of light, love and laughter. The pain of this loss, even with weeks to prepare, was staggering. And while the pain has dulled with the passing of time and everyday life, it is still profound. But somehow, the pain of losing Emily — the first loss of a 2016 that left us bare — has made me better. More patient, more open, more compassionate, more prayerful. It has made me aware of God’s voice, and grace. It has brought incredible people into my life as new friends, too many to mention. Abundance at its best. The enduring pain, feeling as waves sweeping in from just outside my sight line, has forced me to intentionally practice self care, humility and forgiveness. And it’s taught me (and my kids) that it’s okay to cry when you’re hurting because we know the tears won’t last forever. And it is that certain hope — we won’t cry forever — that delivers the beauty of today. We are living. We are loving. We ache because this world is less beautiful without Emily. But the miracle? We are still here, and there is joy. Somehow. So what can I do, one year later? How do I remember my one and only twin-law? How can this milestone be made into something more than tears? Find joy — or create it for someone else. Whether you knew her or not, I’d love your help choosing one of these things to do — today. For Emily. For me. Hug someone tight, long and hard. Sing along to a song on the radio, as if it were karaoke night and your very life depended on it. Pray with a grateful heart. Drink a glass of (very) sweet wine. Disregard any technology that makes life too complicated. Listen carefully to someone’s troubles, and show them you care with a smile or squeeze of the hand. Laugh hard — especially if you are prone to snorting. Say “I love you,” without hesitation. Life is marked by the big moments, but it should be enjoyed by the little ones. A card game. An afternoon walk. A living room concert. Watermelon slices on the beach. Thank you for sharing one little moment of your day to remember a woman you maybe never met — a wife, mom, sister, daughter, friend. A woman who, even on this day, is helping me find joy. Somehow. I’m passionate about making things better through strategic communications and collaboration. And I’m crazy about my family, sharing stories, big laughs and great food. It was perfection in my eyes. Even as my experience and qualifications grew, this spoke to all of my real passions and blended together my professional goals with my personal loves. It was a whole reflection of Kristin. But what happens when personal or professional growth outgrows what was there before? In the past few months, there’s been a lot. And there’s been a new side business in network marketing. As I’ve grown, I’ve started to worry about how to incorporate a larger sense of myself into the existing brand. As I recently told a couple of girlfriends one late night, the worry isn’t that what I originally identified as my brand is no longer true because, in fact, it still is. The worry has been taking a broader calling or purpose and figuring out how it is congruent with who I’ve been before. I feel a little bit like the traffic engineer determining how best to widen a busy road from two lanes to three, so maybe I’m worried because my traffic engineering knowledge is limited. But then again so is my network marketing knowledge … yet here I am. Network marketing, direct sales, multi-level marketing — take your pick. It’s a place I never expected to find myself, and certainly one that challenges my comfort zone daily. But it had been calling my name, soft and clear, for months. And in the time since, I’ve discovered that sharing plant-based health and wellness products that help my loved ones feel their very best — that fits who I am, too! This business readily connects my communications skills with my desire to directly help the people I love. Crazy or not, it’s a perfect fit. It’s challenging and rewarding. It helps me contribute more to our family’s financial security. And, full disclosure: I’m kind of starting to love it. The best thing is, the authentic Kristin remains at the intersection of the circles, even with the new addition. If I grow and change as a person, it only makes sense that my personal brand would need to adjust. And despite the peace I’ve had on my new journey, there still was quiet panic as I began to create new and different type of congruence. But that panic eventually revealed a simple answer. One word. I’m passionate about making things better through service, strategic communications and collaboration. And I’m crazy about my family, sharing stories, big laughs and great food. When I stumbled on such a simple solution — the mere addition of the word service — I realized it was, in fact, a more authentic version of Kristin than even the first. Service — to people in my profession, to people I know, to strangers who ask for help — has always been me. It took a few bends in the road this year for this calling to come in clear. And it took a risk of starting a new business to make the shift clear in my mind. But once these things came into focus, so did my authentic personal brand. It all still fits. A straightforward question, asked by a school PR colleague and new friend over drinks this summer. And I was happy to tell the story of an e-mail on a snowy Sunday, asking me to expand an article into book form. Except that’s not what I told him. Listening to myself answer (and seeing the half puzzled, half entertained look on his face as I spoke), I realized that there was a narrative swirling inside me that hadn’t yet found its way out. See, there’s a thing — a very strange thing — that’s been teeter-tottering inside my head for awhile. And if I can’t regularly tell if the teeter totter is up, or down, it’s hard to know what to say, or write. Bumping into a friend, or meeting up for coffee or lunch, I wavered between letting it all out (and likely startling the person in my company), or keeping it in. But as my husband will tell you, I’m not very … adept … at keeping things in. So far, 2016 has been a year of uncommon pain, uncommon mystery and uncommon peace. And although this story doesn’t really fit a lunch date — let alone a 500-word blog template — it’s been burning lines in my brain for too long, so out it comes. My husband’s twin sister passed away on February 7, a Sunday. 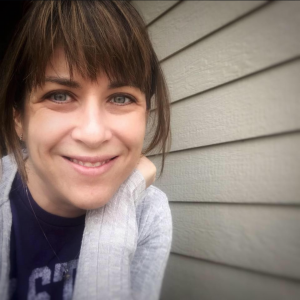 At 39 years old, she’d battled advanced colon cancer for nearly five years. She’d shown grace, courage, patience and enormous faith. Our hearts ache in a world without Emily. Two weeks later our family dog suffered a stroke and passed away on February 21, a Sunday. Pet owners of the world understand the profound loss of a loyal friend of 13 years. She would have turned 14 a few weeks later. Our house is not the same without Bailey. A couple months later, my aunt, age 49 with two beautiful teen daughters, went to bed feeling unwell on a Monday night in May. She didn’t wake up on Tuesday, following a massive heart attack in the night. Another wife and mom, gone much too soon. And a month after that, our friend and beloved pastor passed away very suddenly after a short hospital stay. The news came at the end of the Mass; age 61, he had died, just moments before the Sunday morning service began. His absence is felt in our hearts, in our parish and in our community. Uncommon pain. But also uncommon mystery. 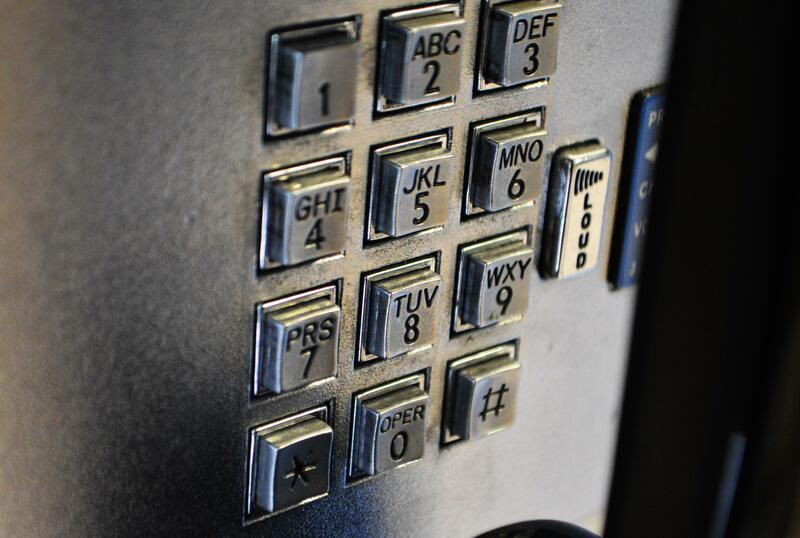 On a Friday afternoon in May, I was sitting in my office when my cell phone rang. It was a number I didn’t recognize from a town a few hours away, and for the first minute or two, I was sure it was a wrong number. “Someone who knows you gave me your number and said you could help me.” … “I can’t talk now because I’m waiting for my appointment at the cancer center.” … “I need help with my kids.” … “I’m going to say a word, and if you understand what it means, you’ll understand what I need.” … “Trafficking.” I stopped in my tracks. I had to help. Two Fridays later, I got a call at the office — this time on my desk phone. My coworker warned me, “the number is blocked, and she won’t give me her name.” I’ve had stranger transferred calls in my school PR life, so I answered. The woman on the other end of the line was suffering at the hands of a stranger, a cyber bully. She said her life was on the verge of ruin, following the disclosure of personal and financial information, and she was desperate. I hit pause on my day. I had to help. A couple weeks later, an enormous box was delivered to my house. It was addressed to my husband, and inside was a box of 200 diapers, a very large box of overnight pull-ups, an industrial size package of dish soap and a refill of bottle soap. My husband checked his Amazon account and found no shipment. (A relief considering the items would have totaled $100, probably more.) We left it be, asked the UPS man and left it in the garage. Two weeks later, a Thursday, my friend who works at the domestic violence center posted on Facebook that there were a record number of kids at the shelter. They were in immediate need of large size diapers and pull-ups. I delivered our mystery shipment the next morning. Uncommon mysteries. And uncommon peace. In the spring and early summer, there were many more moments (though less incredible) when I’ve found myself at a crossroads with someone who needs help. There came a point where I realized this was more than a random series of events. In each of these moments — probably a dozen, if I’m honest — I’ve felt led. Guided. Used for a bigger purpose. If you’re a person of Christian faith, we call this the Holy Spirit. If you believe it’s God or gods or the Universe at work, I also hear you. I’m less concerned with the name of this force than the message it brings. It is calm, it is humble, it is gentle, it is powerful. And the message it has delivered is that I must be unafraid to respond. Actively help those in need. Choose to serve the vulnerable. Watch and listen. Be ready. Be open. I’m a Kansas girl. Born here. Educated here. Married here. Raising a family here. Even in the year of college that I studied and lived in France, Kansas has been home. As a kid, this didn’t exactly feel like bragging rights. Rectangle state with a little jagged corner. A teacher once suggested to me and my classmates that we could find Kansas on a U.S. map by looking in the middle of the country for the cracker with a bite out of it. Kansas has largely been function over form, to be sure. But Kansas is much more than fly-over country. And although I know my regular blog audience hails from mostly other places, today I’m celebrating Kansas Day. Because if you’ve watched the news (or the Daily Show) over the past few years, Kansas is bleeding. Our state is in crisis. The state budget is in ruin. A scary majority of our elected officials are focused on their own careers, their own pride, or their own pocketbooks. The ultra wealthy have bought the highest offices in the land, driving policy with impunity. Our leaders double down on fear, blame and division. Kansas public schools, long among the nation’s very best, have been discredited, are being defunded and are actively targeted to be dismantled. The poor and vulnerable of our state are now shamed and, in too many cases, farmed out to the highest bidder. 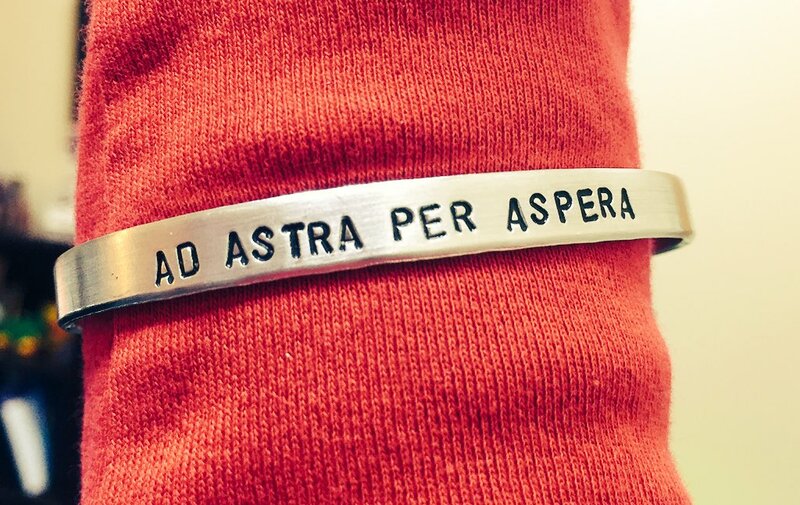 But today, Kansas’ 155th birthday, I’m focused on our state motto: Ad Astra Per Aspera. To the stars through difficulties. And I refuse to give up. Today, I’m focused on why I fight for this state. It’s the state of my dad, his dad, and his dad the generation before. German settlers who homesteaded in the middle of the state and believed in the common good. Strong people who worked hard and helped each other. And smart people who understood that public education is essential to the future of democracy. I’ve heard stories about small, scattered Kansas prairie towns where families scraped together what little they had to hire a teacher. This is Kansas. My grandfather grew up on the family farm, and my grandmother lived there with her new in-laws when Grandad was stationed in Japan for World War II. After the war there was college, hard work on the farm and enterprising business decisions. Grandad, who built two of his family’s homes, opened a variety store in one small Kansas town and later operated a Ben Franklin and department store in another. And Grandma, born and raised in Oklahoma, worked right alongside, his equal. She raised three boys and Eagle Scouts, helped run the stores and single-handedly chased down custom cutting crews when crops were ready to be harvested. They were a team of two intelligent, hard-working, enterprising people. They are Kansas. Fast-forward to my life, with all the advantages offered by an extraordinary public education. My school district was admired nationally for excellence, and I had every opportunity to create whatever future I wanted. Classmates went off to Harvard, Yale, Stanford, NYU and elsewhere. I decided to stay in Kansas and squeeze every ounce of goodness out of my five years at Kansas State University, the nation’s first land-grant university. I played in the symphony, recorded a CD with a string quartet, wrote for the award-winning daily newspaper, studied abroad and enjoyed access to world-class performers and lecturers. (I also enjoyed the benefits of a university that has a dairy science program. Hello, ice cream!) This is Kansas. After graduating, I had professional and personal opportunities to be part of two Guinness record-setting flights piloted by Steve Fossett in the Virgin Atlantic GlobalFlyer, play backup for Collin Raye and write a book. All while living and working — in Kansas. When I was a teenager, Grandma would tell me about leaving her family when she was my age and enrolling in business college in Wichita. She wanted to make sure I knew, she chose Kansas. “All people are respected here, even women.” “Kansas wasn’t a slave state — it was a Free State.” And the one I can still hear her saying, “Kansans aren’t rednecks, hicks or bandits.” I wish I could say I appreciated her perspective at 16, but I certainly do today. And the more I know about Kansas, the deeper my appreciation and love. Kansas was built by populists. It was the first in America to ban the Ku Klux Klan and the first to elect women to public office, one as mayor and another as sheriff. Our state capital — now the center of so much scandal and destruction — is home to the pioneering civil rights decision integrating public schools, Brown v. Topeka Board of Education, the first of its kind in the nation. The first state to elect a woman to the U.S. Senate on her own merits, without following a term that her husband had served. The native home of Dwight Eisenhower, Erin Brockovich, Langston Hughes, Amelia Earhart, William Allen White and Charlie Parker. This is Kansas. The Hutchinson News editorial board wrote an obituary of our state nearly three years ago, documenting the painful highlights of losses we’ve suffered, ground we’ve lost. It’s worth reading again, sobering though it is. But Kansans are fighters. And we don’t give up. Not before, and not now. The sky may be very dark, but the Kansas stars are still out there — and they’re worth fighting for. Ad Astra Per Aspera. And happy birthday, Kansas. Professional letters came later — CPA, MD, MBA, Ph.D. Like the letters before them, these tell another person a great deal of information. If I see these letters with someone’s name, I can likely quickly discern the type of work they do and their level of education. As a journalism student studying public relations in college, professional letters weren’t on my radar. It wasn’t until several years later — almost 10 years ago now — that I haphazardly joined the world of school public relations. 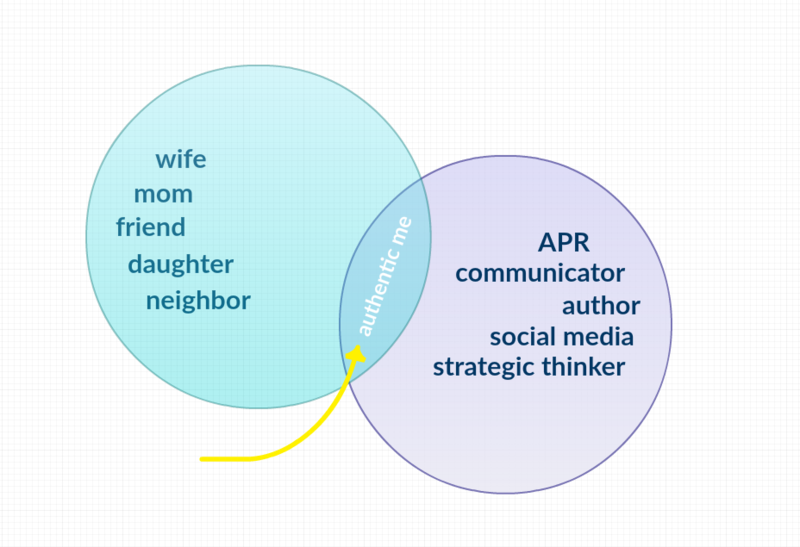 And shortly after that, I learned about the APR credential — accredited in public relations. And now — as of last week — I’ve officially earned the right to add APR to my name. I have my own special letters. I passed a review panel of my peers (peers who already had received their APR) last March. I passed a three-hour computerized exam with 163 questions in early January. I can now tell you a thing or two about Grunig’s situational theory of publics, the difference between line and staff functions and why P.T. Barnum was way more than just a circus guy. Most importantly, my APR means I’ll continue fine tuning my work to be strategic and based in best practices of social science and professional ethics. It’s a commitment to continued learning, throughout my career, to ensure that I deliver ever greater value to my employer — with focus and confidence as I do. Now, for my PR friends and colleagues, the APR also might mean, “those letters I really should start working on.” At least, that’s what APR meant to me for much of the last 9+ years. Because I quickly noticed that many of the people who were helping me adjust, learn and grow in this new-found school PR world of bond issues, teacher negotiations, angry parents and Kindergarten Roundup — also had APR behind their name. I admired the quality of their work, the value of their perspective — and I wanted to join their ranks. I wanted the letters. Getting the APR was a long and winding road, mostly because the past 10 years have included having a baby, raising kids, buying groceries, doing laundry and working in a busy full-time job. (This is where I give a HUGE shout-out to all the single moms, working college students and others who find a way to fit these things together. You are amazing.) I also was crazy enough to write a book two years ago, which put me back a good year when I was really starting to prepare in earnest. Start when the time is right. I leveraged a bit of a mom window, nestling the bulk of my work in a sweet spot between when my kids were old enough to be in school, but (mostly) young enough to avoid a family schedule packed with evening and weekend activities. The accreditation board requires that candidates have at least five years of experience; looking back I’m certain that I was a better APR candidate at this stage of my career than I would have been a few years out of college. Enlist your boss’ support. Key to my shift from That’s a goal of mine to I’m working on my APR was having it written into my evaluation a few years back. It kept me on track, held me accountable and allowed me to spend some of my regular office hours on my panel and exam preparation. Having it formally documented in my evaluation also paid dividends when I transitioned to a new superintendent partway through my preparation. Expect a shock to your system when you begin studying for a major exam, especially if you’ve been away from college for 10 or 15 years. I found myself longing for the discipline I once had as a successful high school and college student. Flash cards, study guides and textbooks — exam preparation takes dedication, persistence and old fashioned hard work. More than one APR has told me that a second try at the exam is what they needed, after coming up short the first time. The goal is not to be perfect — the goal is to finish. 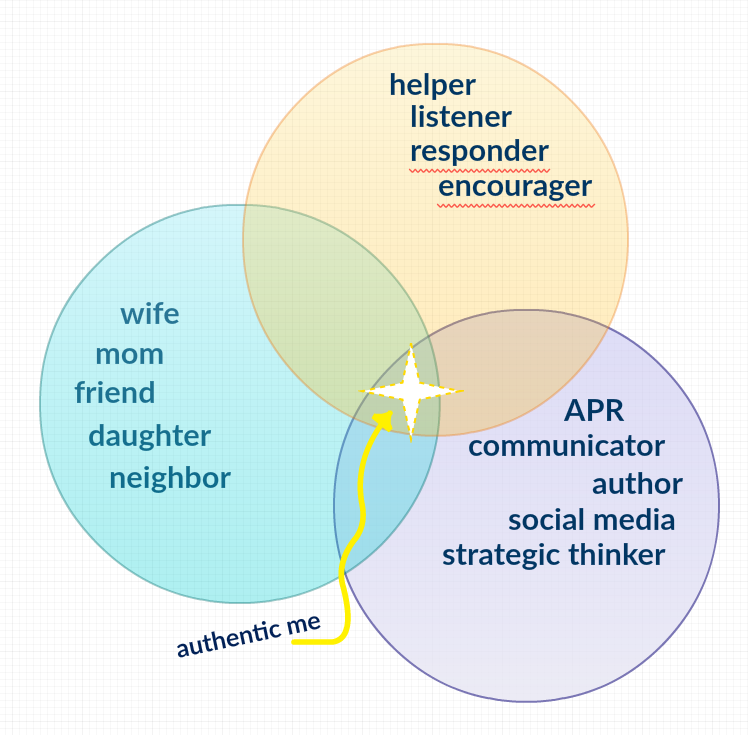 And most importantly, enlist the help, encouragement and support of the APRs around you. 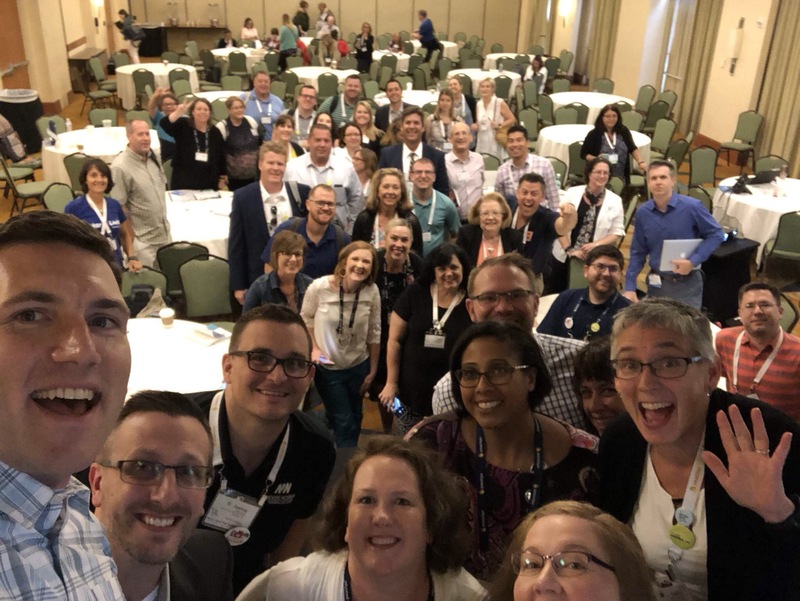 Find them through NSPRA or PRSA. Find them on Twitter. Ask your friends. And ask for help. Without exception, current APRs were happy to provide whatever I needed to make the journey a little easier. If you’re a communications professional, I would love to connect and encourage you to go for your APR when the time is right. And as much pride as I feel having these letters on a letter addressed to me, it truly pales in comparison to the perspective, knowledge and clarity I gained along the way. Today’s the day: Thanksgiving. 40th birthday. And the end of my Feed 40×40 appeal to friends and family. We’ll eat turkey and pie. And I’m anticipating that someone, at some point in the day, will sing Happy Birthday. But that third thing — the crazy Feed 40×40 thing — well, that’s not as straightforward. It’s going to take that one awhile to sink in. Fortunately for today, the numbers are pretty straightforward. You’ll remember, I asked my friends, family and followers to pitch in and collectively donate a total of 1,600 items+dollars to local food pantries before my birthday on Nov. 26. I had my doubts about reaching the goal just 10 days ago. But we did it. And then we did it three more times. That’s right, the total (which is still creeping up as I write) is more than 6,400. That’s 40×40, times 4. And based on the forms that were completed, by more than 80 (!) 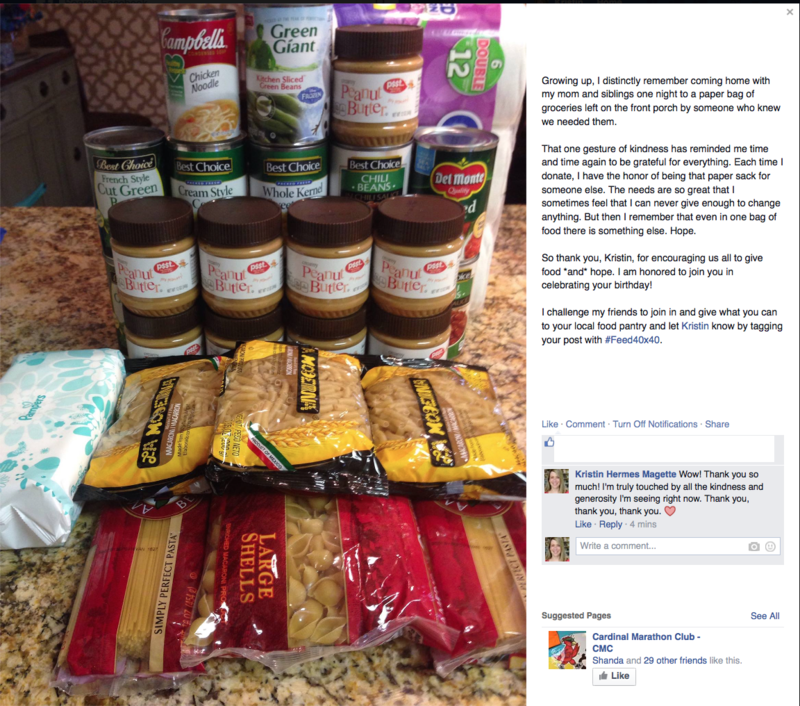 individuals, this generosity helped feed hungry families in 12 (!) states. Kansas. Missouri. Ohio. Texas. New York. North Carolina. South Carolina. Arizona. Colorado. Wisconsin. Utah. And Minnesota. Wow. Donations have come in all sizes and shapes. (And they’re still trickling in, so if you want to include yours in the final count, please fill out my form right now!) From small cash gifts to large, orchestrated food drives in schools and offices, every single person who said I’m in! helped make an enormous difference. Growing up, I distinctly remember coming home with my mom and siblings one night to a paper bag of groceries left on the front porch by someone who knew we needed them. That one gesture of kindness has reminded me time and time again to be grateful for everything. Each time I donate, I have the honor of being that paper sack for someone else. The needs are so great that I sometimes feel that I can never give enough to change anything. But then I remember that even in one bag of food there is something else. Hope. So, to all of you who said yes to Feed 40×40: This is what we did. Yes, we reached a goal and made my 40th birthday wish come true. But what really mattered? We delivered hope. And that, my friends, is what makes me most thankful.